Preprints (earlier versions) of this paper are available at http://preprints.jmir.org/preprint/5774, first published Mar 23, 2016. Background: Stress has been identified as one of the major public health issues in this century. New technologies offer opportunities to provide effective psychological interventions on a large scale. Objective: The aim of this study is to investigate the efficacy of Web- and computer-based stress-management interventions in adults relative to a control group. Methods: A meta-analysis was performed, including 26 comparisons (n=4226). Cohen d was calculated for the primary outcome level of stress to determine the difference between the intervention and control groups at posttest. Analyses of the effect on depression, anxiety, and stress in the following subgroups were also conducted: risk of bias, theoretical basis, guidance, and length of the intervention. Available follow-up data (1-3 months, 4-6 months) were assessed for the primary outcome stress. Results: The overall mean effect size for stress at posttest was Cohen d=0.43 (95% CI 0.31-0.54). Significant, small effects were found for depression (Cohen d=0.34, 95% CI 0.21-0.48) and anxiety (Cohen d=0.32, 95% CI 0.17-0.47). Subgroup analyses revealed that guided interventions (Cohen d=0.64, 95% CI 0.50-0.79) were more effective than unguided interventions (Cohen d=0.33, 95% CI 0.20-0.46; P=.002). With regard to the length of the intervention, short interventions (≤4 weeks) showed a small effect size (Cohen d=0.33, 95% CI 0.22-0.44) and medium-long interventions (5-8 weeks) were moderately effective (Cohen d=0.59; 95% CI 0.45-0.74), whereas long interventions (≥9 weeks) produced a nonsignificant effect (Cohen d=0.21, 95% CI –0.05 to 0.47; P=.006). In terms of treatment type, interventions based on cognitive behavioral therapy (CBT) and third-wave CBT (TWC) showed small-to-moderate effect sizes (CBT: Cohen d=0.40, 95% CI 0.19-0.61; TWC: Cohen d=0.53, 95% CI 0.35-0.71), and alternative interventions produced a small effect size (Cohen d=0.24, 95% CI 0.12-0.36; P=.03). Early evidence on follow-up data indicates that Web- and computer-based stress-management interventions can sustain their effects in terms of stress reduction in a small-to-moderate range up to 6 months. Conclusions: These results provide evidence that Web- and computer-based stress-management interventions can be effective and have the potential to reduce stress-related mental health problems on a large scale. Chronic stress can lead to serious psychological and physical implications, such as depression , sleep problems , neck and shoulder disorders , and an increased risk of coronary heart disease events  and related mortality . Substantial economic costs of stress and stress-related psychological disorders arise as a result of absenteeism, presenteeism, productivity loss, and high staff turnover . Given that stress represents a major threat to public health, effective and scalable solutions to accommodate the demand for stress-management interventions are needed. The evidence base on traditional face-to-face stress-management interventions is comprehensive, showing small-to-moderate overall effects in reducing adverse outcomes for mental health . In their meta-analysis on interventions for work-related stress, van der Klink et al  reported a combined effect size of Cohen d=0.34 across all studies. The mean effect size was Cohen d=0.33 for depression and Cohen d=0.54 for anxiety for interventions that focused on individuals . Richardson and Rothstein’s more recent meta-analysis  on occupational cognitive behavioral, relaxation, organizational, multimodal, or alternative stress-management interventions yielded somewhat larger effects, with an overall effect of Cohen d=0.53, an effect of Cohen d=0.68 for anxiety, and Cohen d=0.73 for stress. Evidence consistently shows cognitive behavioral interventions to be the most effective, with Cohen d values ranging from 0.68  to 1.16 . Some evidence also suggests that shorter interventions (1-4 weeks) are more effective than longer interventions; however, this effect may be confounded by treatment type . Existing Web-based stress-management trainings differ in various aspects, such as the intervention content, length, and guidance, which may influence their efficacy. First, the theoretical basis of such interventions is diverse, including cognitive behavioral therapy (CBT) [21-26], third-wave cognitive behavioral interventions (TWC) [27-37], the use of olfactory care products , and physical exercise programs . Second, the length and number of intervention sessions vary, ranging from short 2-week interventions  to interventions that allow access over several months . Some interventions encourage participants to log on only as often as they like, with no specified sessions or requirements to complete the entire intervention , whereas others have fixed weekly appointments (eg, in an online virtual classroom) . Third, the existing Web- and computer-based studies include both guided and unguided interventions and thus differ in the amount of human support given to participants during the intervention. In the guided format, individuals normally receive written feedback from a coach on the exercises that they complete within the training. In the study of Ruwaard et al , for example, clinical psychology students provided weekly feedback on exercises according to an instruction manual and reminded participants in cases of noncompletion. In contrast, Billings et al  used a less intensive, high-latitude format in which no feedback was provided. Are Web- and computer-based stress-management interventions effective in reducing stress, depression, and anxiety relative to a control group? Are there differences in effect sizes concerning (a) the study quality, (b) the level of guidance, (c) the theoretical basis, and (d) the length of the intervention? We considered RCTs from 1990 to May 2016 in which adult participants (older than 18 years) experienced stress and were participating in the trial to decrease their stress levels. The search was initially conducted in August 2013 and repeated in May 2016 to ensure it was as current as possible. Studies prior to 1990 were excluded; due to the rapidly changing technology in this field, these programs cannot be compared to the current interventions that are likely to be delivered to participants seeking help. The primary intervention target of included studies needed to be a reduction of stress within the target group. We excluded trials that targeted participants with medical conditions (eg, cancer, tinnitus, headache); caregivers of people with medical conditions (eg, caregivers for dementia); and participants with psychiatric disorders (eg, depression, anxiety or posttraumatic stress disorder), posttraumatic symptoms, postpartum emotional distress, or bereavement. The studies included needed to compare an intervention to any type of comparison group. There were no restrictions with regard to dosage or intensity, delivery, duration, frequency or timing of delivery, or the type of delivery channel (eg, email, Web-based, computerized). Trials investigating stress management as merely one part of the intervention (eg, alongside depression or anxiety) were included only if the primary goal of the intervention was to reduce stress. Furthermore, trials conducted in the context of the promotion of well-being rather than stress reduction were excluded. The studies had to report at least one instrument that claimed to measure stress levels. For the main analysis, we considered postintervention data. We also included follow-up data (when available) to assess longer-term effectiveness. The search strategy for this meta-analysis was created with four categories of search terms. We defined the search terms to meet the following criteria: (1) stress reduction, (2) evaluation of an intervention program, (3) application of a RCT as an experimental design, and (4) delivery in a Web- or computer-based context. A detailed description of the search terms can be found in the Multimedia Appendix 1. The specified search strategy was applied in three major database search engines (PsycINFO, PubMed, and Cochrane). Additionally, manual searches in key journals (eg, International Journal of Stress Management, Journal of Medical Internet Research, Journal of Occupational Health, Scandinavian Journal of Work, Environment and Health) and in the reference lists of the included studies were conducted. After removing duplicates of the articles identified, two researchers (EH and SN) independently screened all titles and abstracts based on the inclusion and exclusion criteria, and two researchers (EH and DL) assessed the full-text articles for eligibility. The researchers who assessed the relevance of the studies were not blind to the authors, institutions, journal of publication, or results. Data were extracted concerning the origin, the number of participants, age, gender, comparison group, outcomes, theoretical basis, length, guidance, the risk of bias, and follow-up data. In cases of insufficient description, the primary investigators of the respective studies were contacted to obtain missing information. Two researchers (EH and DL) assessed the risk of bias of the included studies in accordance with the Cochrane Guidelines . Thereby, sequence generation, allocation concealment, blinding, incomplete outcome data, and selective outcome reporting were judged. Because we expected only a limited number of studies with relatively small sample sizes, we conducted a power calculation to examine how many studies with how many participants would need to be included to assure sufficient statistical power to identify relevant effects. This power calculation was conducted according to the procedures described by Borenstein and colleagues . We hoped to find a sufficient number of studies to be able to identify a small-to-moderate effect size of 0.35. These calculations indicated that we would need to include at least five studies with a mean sample size of 100 (50 participants per condition) to be able to detect an effect size of Cohen d=0.35 (conservatively assuming a medium level of between-study variance, T2, a statistical power of .80, and a significance level, alpha, of .05). Alternatively, we would need three studies with 150 participants each to detect an effect size of Cohen d=0.35 or nine studies with 50 participants. Analyses were conducted using the statistical software Comprehensive Meta-Analysis (version 2.2.057). The effect size of subjective level of stress was calculated as the primary outcome. Furthermore, we assessed the levels of depression and anxiety when available. If more than one measure per outcome was used and if no primary outcome was indicated, then the mean of the effect size was calculated to ensure that each study yielded only one effect size. A random-effects model was chosen because of the expectations of considerable heterogeneity between studies. We further conducted a series of subgroup analyses according to the mixed-effects model. In this model, studies within subgroups are pooled with the random-effects model, whereas tests for significant differences between subgroups are conducted with the fixed-effects model. Because of the small number of studies providing follow-up data, the subgroup analyses were performed only for posttreatment and the results from the follow-ups for the primary outcome stress were clustered into two categories (1-3 months and 4-6 months). In three studies, two treatments were compared with a single control group [36,38,42]. In these cases, we treated each comparison as a separate study, and we avoided the double counting of controls by dividing the control group in half. The effect size in the form of Cohen d was used to represent the standard mean difference between the means of the intervention group and the control group at posttest. According to Cohen , d=0.2 can be considered a small effect, d=0.5 is a medium effect, and d=0.8 is a large effect. Because of the difficulty of interpreting Cohen d from a clinical perspective, we also transformed these values into numbers needed to treat (NNT) according to the formula of Kraemer and Kupfer . The NNT indicates the number of participants who need to be treated to generate one additional clinically significant change . Furthermore, we conducted the following subgroup analyses: the theoretical basis of the intervention (CBT, identified by including cognitive restructuring/challenging dysfunctional thoughts; TWC, identified by inclusion of more recent CBT-based techniques such as mindfulness, meditation, or acceptance of emotions; and alternative interventions [ALT]), guidance (guided with regular written feedback; unguided with no support or only technical support), length of the intervention (short: 1-4 weeks; medium: 5-8 weeks; long: ≥9 weeks), and the risk of bias (low risk=4; some risk<4). Moreover, a test of homogeneity of the observed effect sizes was calculated using the I2 statistic as an indicator of heterogeneity in percentages. Thereby, a value of 0% indicates no heterogeneity, 25% is considered low, 50% is considered moderate, and 75% is considered a high level of heterogeneity . We calculated 95% confidence intervals around I2  using the noncentral approach based on chi-square within the heterogi module for Stata . Although we calculated the Q-statistics, we only report whether the result was significant. Publication bias was investigated by conducting a visual inspection of the funnel plot for the primary outcome measure. An asymmetric as opposed to a symmetric inverted funnel shape indicates potential publication bias that could compromise the conclusions drawn from the meta-analysis. Egger’s test  was used to test for the significance of the likely presence of publication bias. Additionally, we performed Duval and Tweedie’s trim-and-fill analysis  to verify an unbiased estimate of the pooled effect size. This analysis calculates an estimation of the number of missing studies and the potential effect of these studies on the outcome. The systematic literature research resulted in 2137 abstracts. An additional nine potentially relevant articles were identified through other searches. After removing the duplicates, we screened the titles and abstracts of 1781 articles and excluded 1687 articles because of their apparent irrelevance. With regard to eligibility, 94 full-text articles were retrieved and assessed by two independent raters (EH and DL); Cohen kappa for agreement between the independent raters was very good (Cohen κ=.83). Any discrepancies were resolved by discussion. We included 27 studies according to the inclusion and exclusion criteria. However, the results of one study  were accounted for in one of the other included articles  and it was not possible to calculate effect sizes for three studies due to insufficient data [52-54]. In three studies [42,55,56], a small proportion of the participants were younger than 18 years, which was the prespecified criterion of being classified as adults. Because the studies fit all the other inclusion criteria and our sensitivity analyses indicated no difference in the overall results, we decided to include those studies. Thus, we included 23 studies in the analysis. These 23 studies included 26 comparisons from baseline to posttest. Follow-up data were available for four studies (six comparisons) at 1 to 3 months and for six studies at 4 to 6 months. The PRISMA flowchart of the study selection is presented in Figure 1. Selected characteristics of the 23 included studies [21-39,42,55-57] are presented in Table 1 (trial characteristics) and Table 2 (intervention characteristics). A more detailed description of the interventions is available in the Multimedia Appendix 2. The total number of participants was 4226 (intervention groups: n=2312, control groups: n=1914). The included interventions varied according to the intervention content (see Table 2 for details). Most studies evaluated interventions based on TWC (13 comparisons), followed by ALT interventions (7 comparisons), and CBT interventions (6 comparisons). Seventeen studies used a waitlist control comparison, three studies a no-treatment control group, and three studies used an attention control group. The included studies were predominantly conducted in the United States (11 studies), followed by Germany (3 studies), Sweden (2 studies), Austria/Switzerland (2 studies), Japan (2 studies), Norway (1 study), the United Kingdom (1 study), and the Netherlands (1 study). aAT: Austria; CH: Switzerland; DE: Germany; GB: United Kingdom; JP: Japan; NL: the Netherlands; NO: Norway; SE: Sweden; US: United States of America. bIndicates only the number of participants included in this analysis. cAC: attention control group; ALT: alternative; CBT: cognitive behavioral therapy; NT: no treatment; OMB: online message board; TWC: third-wave cognitive behavioral therapy; WC: waitlist control. dBAI: Beck Anxiety Inventory; BJSQ-A: Brief Job Stress Questionnaire-Anxiety Subscale; BJSQ-D: Brief Job Stress Questionnaire-Depression Subscale; CES-D: Center for Epidemiologic Studies Depression Scale; DASS-A: Depression Anxiety Stress Scales-Anxiety Subscale; DASS-D: Depression Anxiety Stress Scales-Depression Subscale; DASS-S: Depression Anxiety Stress Scales-Stress Subscale; HADS-A: Hospital Anxiety and Depression Scales-Anxiety Subscale; HADS-D: Hospital Anxiety and Depression Scales-Depression Subscale; JSBQ: Job Stress Brief Questionnaire; LOS: Level of Stress (self-created instrument); PHQ-4: Patient Health Questionnaire for Depression and Anxiety; PNQ: Personal Strain Questionnaire; PSQ: Perceived Stress Questionnaire; PSS-10: Cohen’s Perceived Stress Questionnaire (10-item version); PSS-14: Cohen’s Perceived Stress Questionnaire (14-item version); SODS: Symptoms of Distress Scale; STAI: State Trait Anxiety Inventory. eRisk of bias was judged according to the following criteria: (1) adequate sequence generation, (2) allocation concealment, (3) blinding (± indicates that only self-reported data were used), (4) adequate consideration of incomplete data, and (5) prevention of selective outcome. +: no bias; –: bias; ? : information was insufficient to make judgments. fExt: extended follow-up; m: months; w: weeks; y: years. Table 1. Selected trial characteristics of the included studies (N=23). aALT: alternative; CBT: cognitive behavioral therapy; TWC: third-wave cognitive behavioral therapy. bAFG: Adherence-focused guidance; G: guided; UG: unguided; UG (R): unguided with reminders via mail or telephone. Table 2. Selected intervention characteristics of included studies. The interventions of the included studies were mainly Web-based interventions (n=20). For Web-based interventions, an active Internet connection is necessary (eg, to access a website, use a mobile phone app, or visit a virtual classroom). A total of three computer-based interventions [23,25,39] were found in which interventions were installed, for example, on a desktop computer in a separate room at work. The Perceived Stress Scale (PSS-10, PSS-14) was predominantly used to assess the level of stress (15 of 23 studies). Follow-up assessments have been reported for nine studies (12 comparisons); whereas four studies (6 comparisons) reported data for up to 3 months and six studies (6 comparisons) for 4 to 6 months (see Table 1). Extended follow-ups (no comparison with the respective control groups) were conducted at 1 month (2 studies), 3 months (1 study), 6 months (2 studies), one year (2 studies), and 3 years (1 study). For nine studies, only posttest assessments were available. The participants received guidance in seven studies [24,26,27,34,35,37,42], one study  assessed a less intensive guidance format (adherence-focused guidance: combination of reminders and written feedback only on request of the participants), and 16 studies (18 comparisons) investigated unguided interventions. Nine unguided studies reported the use of automated or telephone and mail reminders for completion of the intervention [23,25,28,29,33,36,42,55,56] (Table 2). A risk of bias was present in all studies. Only six studies fulfilled four of the five criteria used. Nine studies met three criteria, and eight studies fulfilled two criteria. In most cases, the concealment of allocation was insufficiently described, and only 13 of 23 studies reported adequate handling of missing data. In particular, the risk for selective outcome reporting was unclear because the study registration prior to the trials could only be retrieved from three studies [31,32,34]. Although another four studies registered their trial [28,30,33,36], this step occurred retrospectively. The mean interrater reliability between independent raters was κ=.84 and ranged from .60 (selective outcome reporting) to 1.0 (blinding). Disagreements were handled by discussion. Neither the inspection of the funnel plot nor the Egger’s test  indicated a possible publication bias. Moreover, the Duval and Tweedie trim-and-fill analysis  indicated no missing studies. Table 3 presents the effect sizes, confidence intervals, level of significance and heterogeneity for the overall effects on stress, depression, and anxiety as well as for the subgroups. The overall analysis of effect sizes yielded a significant effect size of Cohen d=0.43 for the primary outcome stress across all studies (95% CI 0.31-0.54; n=26). Heterogeneity was moderate (I2=68.01, 95% CI 52.08-78.72). Significant small effect sizes were observed for the secondary outcomes depression (Cohen d=0.34, 95% CI 0.21-0.48; n=13) and anxiety (Cohen d=0.32, 95% CI 0.17-0.47; n=14). Figure 2 displays a forest plot of the effect sizes and the confidence intervals of the included studies. aThe P values indicate whether the Q-statistic is significant (the I2 statistics do not include a test of significance). bThis P value indicates whether the differences between subgroups were significant. cSubgroup calculations for the primary outcome stress. dOne study  was excluded because it could not be classified. Table 3. Effects of computer- and Web-based stress-management interventions for healthy adults compared to control groups. Figure 2. All effect sizes included in the meta-analysis from the studies comparing computer- and Web-based stress-management interventions to a control group. BJSQ: Brief Job Stress Questionnaire; DASS-S: Depression Anxiety Stress Scales-Stress Subscale; LOS: Level of Stress (self-created instrument); PSQ: Perceived Stress Questionnaire; PSS-10: Cohen’s Perceived Stress Questionnaire (10 item version); PSS-14: Cohen’s Perceived Stress Questionnaire (14 item version); SODS: Symptoms of Distress Scale. Accounting for the risk of bias level was associated with a considerable reduction of heterogeneity: studies with a lower risk of bias showed low heterogeneity (I2=35.44, 95% CI 0.00-74.20). Subgroup analyses revealed that studies at low risk produced significantly larger effect sizes (Cohen d=0.74, 95% CI 0.59-0.89; n=6) than did studies with some risk (Cohen d=0.30, 95% CI 0.21-0.40; n=20; P<.001). The subgroup analysis of the theoretical basis of the interventions was significant (P=.03) and showed that TWC interventions produced a highly significant medium effect size of Cohen d=0.53 (95% CI 0.35-0.71; n=13). CBT interventions led to reductions in stress levels with a highly significant effect size of Cohen d=0.40 (95% CI 0.19-0.61; n=6). In contrast, ALT interventions produced a small effect size (Cohen d=0.24; 95% CI 0.12-0.36; n=7). With regard to the subgroup guidance, the results show that guided interventions (Cohen d=0.64, 95% CI 0.50-0.79; n=7) were significantly more effective than unguided interventions (Cohen d=0.33, 95% CI 0.20-0.46; n=18; P=.002). A significant difference was also found for the length of the interventions (P=.006). We found significant small-to-medium effect sizes for short (Cohen d=0.33, 95% CI 0.22-0.44; n=9) and medium interventions (Cohen d=0.59, 95% CI 0.45-0.74; n=13), whereas long interventions led to a nonsignificant effect size of Cohen d=0.21 (95% CI –0.05 to 0.47; n=4; P=.11). Results of the 1 to 3 month follow-ups for the primary outcome stress showed a small effect size of Cohen d=0.33 (95% CI 0.19-0.46; n=6) and, for the 4 to 6 month follow-ups, a medium effect size of Cohen d=0.56 (95% CI 0.25-0.87; n=6). 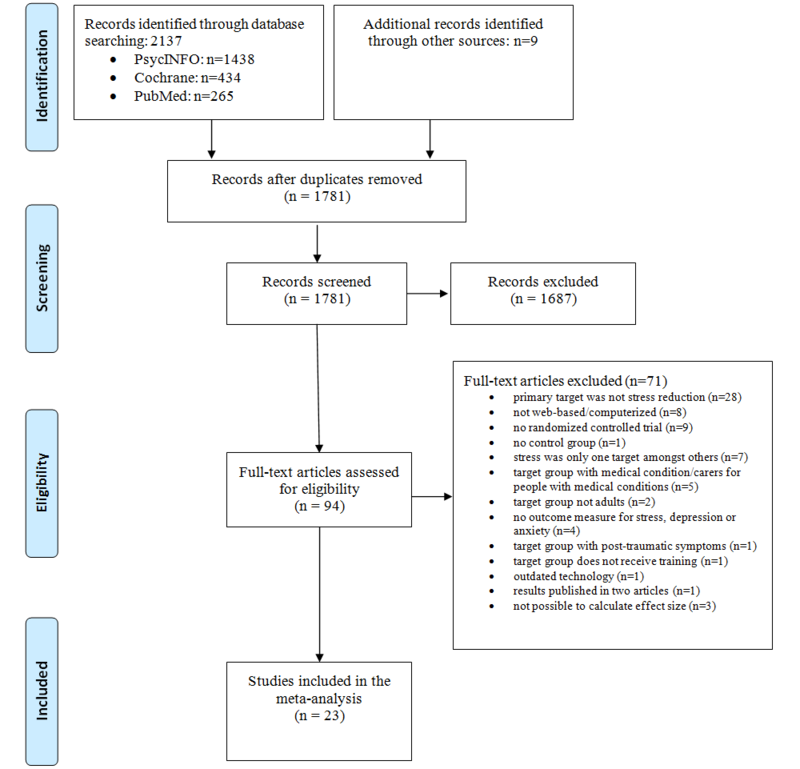 The aim of this paper was to conduct a meta-analysis of Web- and computer-based interventions for stress management in adults. Our analyses yielded four main findings. First, Web- and computer-based stress-management interventions can be effective in reducing stress, depression, and anxiety and maintain those effects for up to 6 months. Second, interventions using TWC and CBT interventions as a theoretical basis proved moderately effective in reducing stress. Third, short and medium interventions (up to 8 weeks) are more effective than long interventions (9 weeks and longer). Fourth, guided interventions yielded a greater effect size for reduction of stress than unguided interventions. For the primary outcome stress, an effect size of Cohen d=0.43 was found across the 26 comparisons. Small effect sizes were found for depression (Cohen d=0.34) and anxiety (Cohen d=0.32). A recent synthesis of five meta-analyses of traditional stress-management interventions found a between-group overall mean effect size of Cohen d=0.45 (95% CI 0.41-0.48) , which is comparable to the effect of stress, but somewhat higher for the effects of depression and anxiety found in this meta-analysis. To date, no trials have been conducted that aim to assess the equivalence of face-to-face and Web-based stress-management interventions in a methodologically robust design. One trial comparing an online versus face-to-face version of stress management in a single trial indicates that there is no difference in reductions of stress or depression levels . Nevertheless, higher effect sizes were also found in Richardson and Rothstein’s work  concerning individual outcome measures in traditional stress-management interventions, particularly for stress (Cohen d=0.73) and anxiety (Cohen d=0.68). Therefore, it may be possible that traditional interventions yield slightly higher effect sizes. One possible explanation for this is that face-to-face interventions are superior in reducing these outcomes. An alternative explanation is that Web-based interventions may reach affected individuals at an earlier stage, with lower baseline levels and thus less room for improvement. In fact, most studies included in the present work did not use a cut-off on a relevant stress scale, and most of those that did (eg, [23,37,38]) used a relatively low cut-off threshold. It may be the case that participants who are more severely impaired might generally prefer face-to-face over Web-based interventions and that this effect is reflected in greater improvements stemming from their higher baseline stress levels. This is in line with the fact that the highest effect sizes in this meta-analysis were produced from trials targeting highly stressed individuals [31,32,34]. Evidence on a Web-based depression intervention also showed that a higher severity of baseline scores significantly predicted better treatment outcomes . Although the effect sizes found here are somewhat smaller than those found in traditional face-to-face interventions, Web- and computer-based interventions can have greater reach. At the population level, even small-to-moderate effects can have a substantial influence. More research is needed to clarify the effects of face-to-face and Web-based stress-management interventions in direct comparisons. Based on the assumption that the treatment effect varied as a function of other factors, we conducted a number of subgroup analyses. First, we investigated the effect of guidance. The results showed that guided interventions (Cohen d=0.64) are significantly more effective than unguided interventions (Cohen d=0.33), with effect sizes for guided interventions comparable to traditional face-to-face interventions. The finding of guided interventions being superior to unguided interventions is consistent with results on Web-based interventions for other conditions, such as depression and anxiety [60,61]. Providing support to clients in terms of weekly feedback may enhance adherence to the intervention and thus improve treatment efficacy . Such an assumption is in line with a study on pooled data from three RCTs showing that guidance was associated with greater adherence rates in Internet-based stress-management compared to unguided interventions . The finding that guided interventions are more effective than unguided interventions is consistent with a systematic review that found guided Web-based mental health interventions to be significantly superior to unguided interventions . The results in this analysis indicate an advantage for guided interventions, although it is unclear how much guidance and in what manner it produces the largest effect sizes. One trial in this meta-analysis used an alternative, more economic format of guidance (adherence-focused guidance; ie, feedback only on request plus weekly reminders) and produced large effect sizes at posttest and 6-month follow-up , and the adherence rates were comparable to a more intensive guidance format using the same intervention . More research on the relative level and type of human involvement needed in these interventions would be useful . Consistent with existing evidence on face-to-face interventions [8,9], the CBT interventions included in this study were efficacious. The effect sizes of CBT (Cohen d=0.40) and TWC interventions (Cohen d=0.53) were smaller than the average effect size found in two meta-analyses for traditional CBT interventions (Cohen d=0.68 ; Cohen d=1.16 ), although, on average, the effect sizes fall within the confidence interval of the latter work . Direct comparisons examining the relative efficacy of the two training formats would be needed to draw firm conclusions. Due to their proliferation in the last few years, TWC interventions were introduced as a new category in this meta-analysis as they extend the traditional CBT techniques with newer “third-wave” components, such as acceptance of emotions or mindfulness. These interventions have been found to be effective in alleviating symptoms that are associated with a wide range of physical, psychosomatic, and psychiatric disorders [65,66], including stress . Comparable to our findings, early evidence on face-to-face interventions suggests that TWC and traditional CBT approaches are equally effective and acceptable in the treatment of acute depression ; nevertheless, more high-quality studies are needed to support this assumption. As opposed to (third-wave) CBT interventions, alternative approaches (eg, career identity training, combination with olfactory care products) only produced a small effect size. A significant between-group effect was also found for the length of the intervention. In contrast to short-to-medium interventions, long interventions (9 weeks and longer) were not found to be effective. One possible explanation is that it may be more difficult for participants to remain engaged in longer interventions compared with shorter interventions. These results correspond to findings from the area of depression, in which shorter interventions have been found to be more effective than longer interventions . Research on the relevance of treatment intensity suggests that the number of therapy sessions is not related to the outcome and keeping the number of sessions equal, but providing the sessions over a shorter period of time, may be associated with better treatment outcomes . Nevertheless, because there were only four comparisons available for long interventions, this conclusion should be interpreted with care. Future research should examine the optimal intensity and length of interventions. This meta-analysis has a number of limitations. First, because the risk of bias in the included studies was high, these results must be interpreted with caution. Second, the overall number of studies for the follow-up points and for some subgroups is small, limiting the strength of conclusions that can be drawn from these results. Third, we found a moderate degree of heterogeneity for the primary outcome that was reduced when analyzing the level of risk of bias and guidance subgroups; nevertheless, the number of comparisons in some subgroups was small and did occasionally overlap concerning individual studies. Fourth, we are mindful of the possibility that despite our thorough literature search, we might have missed a relevant study. Finally, because of the lack and inconsistency of information provided by the included studies, we were unable to analyze the effect of potentially relevant moderators of the treatment effect, such as the effect of adherence to the intervention on the overall outcome. In future studies, preregistration of trials, an adequate calculation of the sample size, a more detailed description of allocation concealment, and appropriate methods to account for missing values are strongly recommended. We observed that a growing number of studies adhered to the intention-to-treat principle (ie, by employing mixed-effects models); nevertheless, especially for those studies, we recommend to ensure that the reported descriptive statistics are based on adequate methods to handle missing values and do not solely rely on complete cases. This will ensure adherence to the intention-to-treat principle throughout all statistics. Although in most studies the therapeutic approach that was used in the intervention (eg, CBT) is often well described, it would be desirable for future studies to also specify the theoretical model that was used to develop the intervention (eg, conservation of resources theory, transactional model of stress). Overall, more methodologically rigorous studies with a low risk of bias are needed to assess the effect of, for example, particular characteristics of interventions, such as treatment latitude, different levels of guidance, and different types of interventions in a direct comparison. Moreover, information on the number of participants who adhered to the intervention and details on co-interventions alongside training would be insightful. Future research should also test Web- and computer-based stress management interventions against the highest standard in this field (ie, classical face-to-face stress management interventions) and should more frequently include longer follow-up periods (eg, up to 6 months). Data on the cost-effectiveness of such interventions would also be highly relevant. Despite the limitations discussed, it appears safe to conclude that Web- and computer-based interventions can be effective. In particular, interventions that include guidance from an online coach, are of medium length, or that are based on (third-wave) CBT lead to moderate improvements in stress levels. Initial evidence also suggests that the effects can be maintained up to 6 months. Whereas research and practice on traditional face-to-face interventions have been prolific [8,9], research on the efficacy and dissemination of Web-based stress-management interventions is still at the beginning despite the high potential and reach of such interventions. This work draws attention to the need for further studies on the efficacy, cost-effectiveness, and mechanisms of change of such interventions. In summary, the integration of evidence-based Web-based stress management interventions into health care systems has the potential to make a valuable contribution to reducing stress-related mental health problems on a large scale. We would like to acknowledge the European Union (EFRE) for funding this project within the Lueneburg Innovation Incubator, TM 1.1 (project number: CCI 2007DE161PR001). Furthermore, we would like to thank Stefanie Christmann for assisting in the coding of the studies. We would also like to thank Douglas W Billings, Filip Drozd, Katherine Eisen, Yves Hänggi, Jeroen Ruwaard, Benjamin Wiegand, Viann Nguyen-Feng, and Ruth Q Wolever for providing further information on their studies. EH, DE, DL, MB, PC, and HR conceptualized the study. EH, DE, DL, and PC developed the search string. EH, SN, and DE performed the search, selected the studies, and collected the data. EH, DE, and DL analyzed and interpreted the data. EH drafted the manuscript; DE supervised the writing process; and DL, PC, MB, SN, and HR critically revised it. All authors agreed on the final version of the paper. Selected intervention characteristics of included studies. Hassard J, Teoh K, Cox T, Dewe P, Cosmar M, Grundler R, et al. Calculating the Cost of Work-Related Stress and Psychosocial Risks. Luxembourg: Publications Office of the European Union; 2014. Borenstein M, Hedges LV, Higgins JP, Rothstein HR. Introduction to Meta-Analysis. Chichester, UK: John Wiley & Sons; 2009. ©Elena Heber, David Daniel Ebert, Dirk Lehr, Pim Cuijpers, Matthias Berking, Stephanie Nobis, Heleen Riper. Originally published in the Journal of Medical Internet Research (http://www.jmir.org), 17.02.2017.